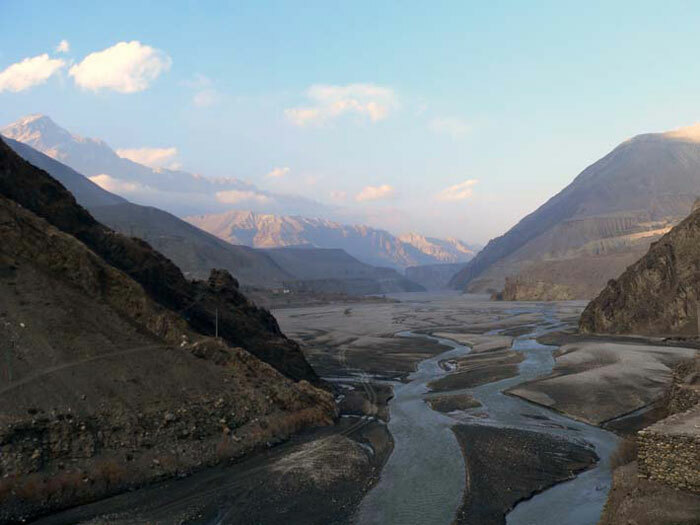 Last Trek Report – TREK REPORT – Kali Gandaki, February 2010 - Trekking in Nepal with Teresa, Slow Trekking for peoples of all ages. Mark and Nola arrived by Thai Airways at midday. Should have been simple enough. However, it was Shiva Ratri (Shiva’s birthday) which meant that lots of roads were closed quite near the airport at Pashupatinath where the main festivities take place. 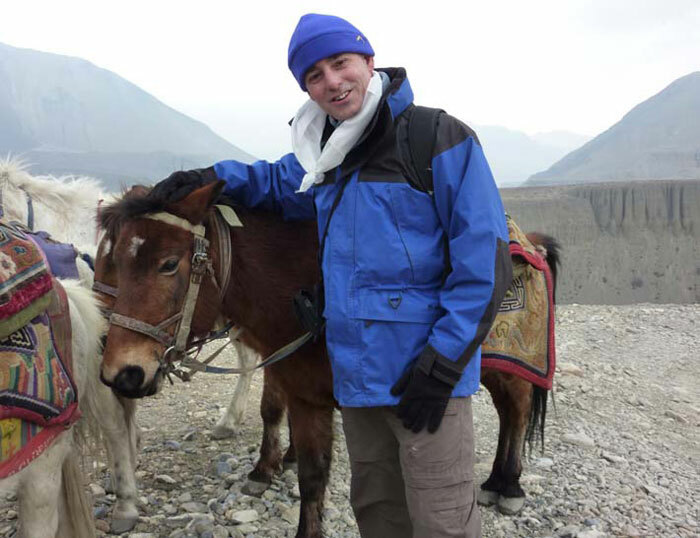 I hooked up with Dorje at Chahabil and we walked the hour and a half out to the airport to meet our minivan which had come the long way around from town. The plane was more or less on time but it was cold, bleak rainy weather as Mark and Nola stepped out of the airport. They looked all-in. It took about two hours to drive a very circuitous route to the Shambala. They slept almost immediately. I woke them for dinner in house and they opted for an early night. The fog was so thick this morning that you could barely see across the street. Freezing cold at 7am as we made our way down to the Bright Future Community Centre where I sometimes help out. We took a glass of scalding black tea at a local shop, hunched over a little brazier on the footpath. The kids were marvellous – though they did make us sing the national anthem (thanks for your help guys!!). Netra took Mark and Nola for a lovely walk up to Kopan Gomba and out to Niru’s tomato farm while I hit the airport again. Much easier today. Flight was a bit late due to fog delays although this miraculously cleared as Doug, Sue, Serge and Cheryl arrived. The Langtang range and Dorje Lagpa were clearly visible as we drove to the Shambala. All were in good form as we sat in the sun-filled garden for a much-needed cuppa. They scored the deluxe apartment on the top floor with stunning views and really swish decor. After a rest spell we were rejoined by Mark and Nola and headed off for a walk to Bouda. Arriving around 5.30 there was a throng of Tibetans circulating around the great white stupa, a river of people spinning the prayer wheels and mumbling Om Mani Padme Hum. Dinner at the Garden Café was great as usual. Their Naan is particularly good so, with various veg curries and a couple of San Miguel beers to wash it down, all were happy. It was a novelty to walk back home with torches as the power is not available all the time at the moment. At least there is a program so we all know when to expect the power to be off – usually when you want a shower! A minibus picked us up at 10 this morning and Dorje took us into Th amel, the tourist centre (read – Backpackers’ Ghetto) of Kathmandu. The Weizen Bakery, as ever, was our first stop for a cappuccino and then we set about the arduous business of shopping. There was banking to be done and sleeping bags and jackets to purchase. We shopped around – possibly a bit more than we needed to – but by the end of the afternoon everyone was kitted out. It was exhausting work but we left all our packages at the bakery and took a turn around the old bazaars of Assan Th ole and Indra Chowk. With the sun getting low the light on the glittering saris arrayed above the shops was very colourful. I personally like the brass and copper shops and all were amazed at the throngs of people. 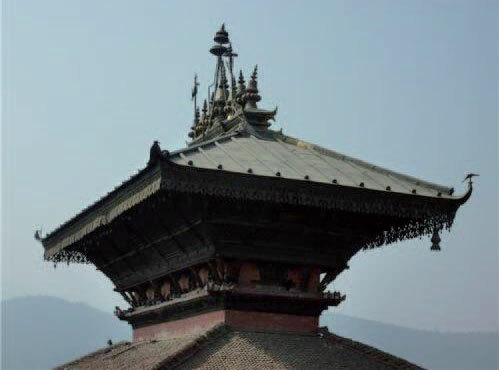 Here and there are wonderful reminders of Kathmandu’s past in tiny, leaning houses with intricately-carved windows. The wiring drew admiring glances and cameras to record this unusual sight. No occupational health and safety issues here! We ate at the hotel tonight – the group found out just how big Nepali spring rolls are. With storage bags safely organised we are ready for a very early start. Our minibus arrived promptly at 6.30 and we were soon speeding through the early-morning streets. The Greenline bus was completely full but we had no delays today. I repeat NO DELAYS! That has to be a first. Nola and Mark were not feeling that good but everyone else enjoyed the amazing trip. The mountains were as clear as I’ve ever seen them with the Ganesh Himal and Manaslu ranges a sight to behold. After a while one becomes accustomed to the near-misses with pedestrians, goats, motorbikes, decorated trucks etc. 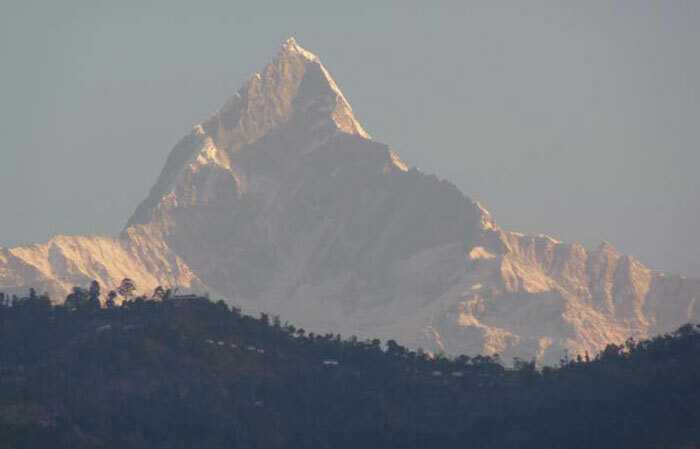 We arrived in Pokhara to a beautiful warm sunny day. Good to see Mankumar and Sanu again. We missed them last season. We walked down to the lake and took a drink in the lovely garden overlooking the lake at the Boomerang. Even after dark it was warm enough to sit outside on the dining terrace for dinner. Dhaulagiri, Machhapuchhre and Annapurna were all visible at sundown – you really CAN see the mountains from Lake Diamond’s dining terrace! I took Serge, Cheryl, Mark and Nola down to the boating ramp with Lahar and Dorje to paddle across the lake. It’s a big lake and takes a good hour to cross. On the other side is a great walk up to the Peace Stupa. Mark, Dorje and Serge went all the way to the top but everyone got high enough for superb views. There was a slight panic after they left as I realised I hadn’t collected their passports for the trekking permits. No worries, photos and passports were soon rounded up on their return and Bijay did a great job in no time flat. We shopped for all the little things we needed for the trek. Nola got a ‘proper’ Nepali trekking hat and lots of scarves, gloves and crocs were bought at bargain basement prices. We had our Pre-trek Briefing on the terrace over a couple of rum and cokes. It was still warm. What a contrast with Kathmandu. All packed and ready for a 5am call tomorrow morning – early night. Not such an early start today as we are on the 3rd flight. We had no luck at all. 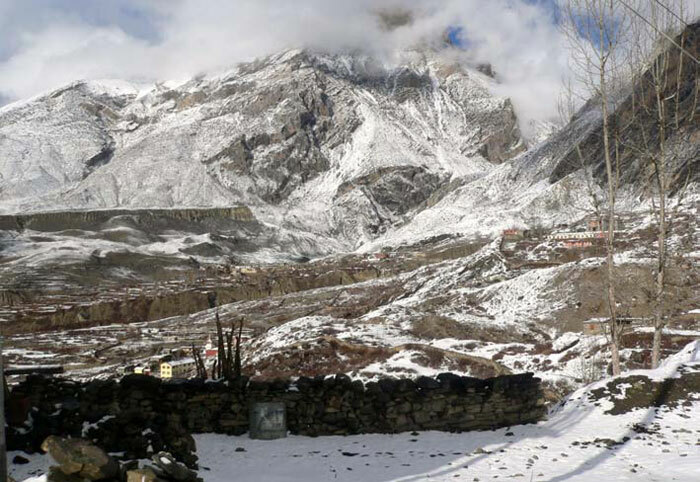 By 9.30 all flights to Jomsom were cancelled for the day. This was something of a relief; at least we didn’t spend the whole morning at the airport waiting and hoping. I decided to use our super airport minibus to take us all the way to Beni and just get on with the trek ourselves. By 10am we were speeding past Phedi on a super-clear day and up into the hills. It felt good to be getting somewhere at last. It took a couple of hours through stunning terraced farmland to reach Maldinga where we scraped together a lunch of potato chips, soft drinks and boiled eggs. The driver then off ered to take us all the way into Beni on a wreck of a road. After a spot of refreshments the boys found us a jeep and we were soon bumping and grinding our way down a dusty track to Tiplyang. We took another break for more chips, coke, etc. – adequate, just. The jeep dropped us off (we were pretty hot and dusty in there) at Ghar Khola and we walked the 40 minutes into Tatopani. The Trekkers’ Lodge was a welcome sight with its lovely garden, and our boys were there too, having walked (run?) 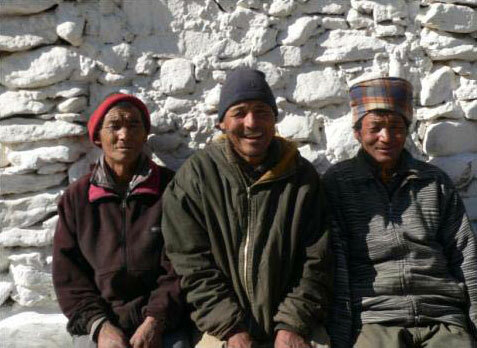 down from Jomsom when they heard we were on our way. The crew headed straight down to the hot springs – unfortunately, they found it full of Germans (what a surprise!). Mark and Serge took the plunge, the rest of us opting for much-needed warmish showers and a cold beer in the garden. The chips are legendary here and the veg moussaka drew favourable reports. Nola has a rotten cold but everyone else is in good shape. 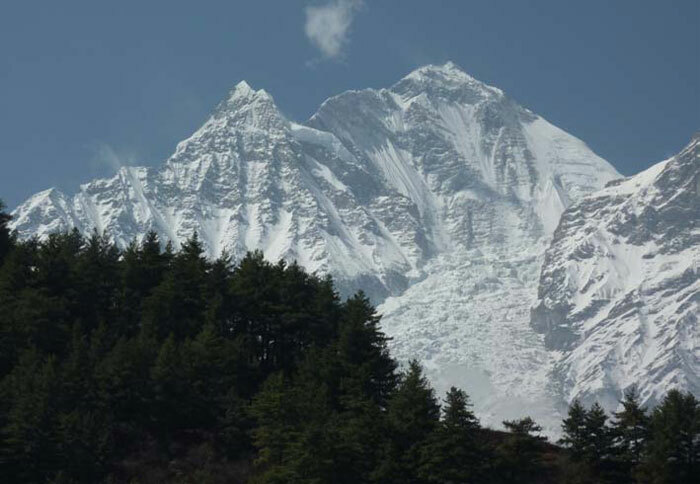 All a bit apprehensive about tomorrow’s big climb up to Ghasa – we had been informed that the road was under repair between Rupse Chhahara and Ghasa necessitating a steep trek over one of the hardest trails on this side of the Annapurnas. It was a big ask for a group who had booked on the ‘easier’ trek. An early breakfast and a jeep ready at 7am to take us 45 minutes up the road to the bridge beyond Rupse. This was a tough climb but we took it slowly. The group handled it brilliantly. I’ve had clients who booked for this kind of moderately hard trekking who made tougher work of this section. 1 hour and 10 minutes to the teashop at Pairo Tapolo – good going guys, especially considering the vast numbers of goats on the track. Even Nola, who was feeling like rubbish, managed it OK. Huge piles of fried rice and a long rest enabled us to walk fairly easily to Ghasa, though the last twenty minutes up to the jeep station just about finished us all off . We met Mangal’s Dad there. 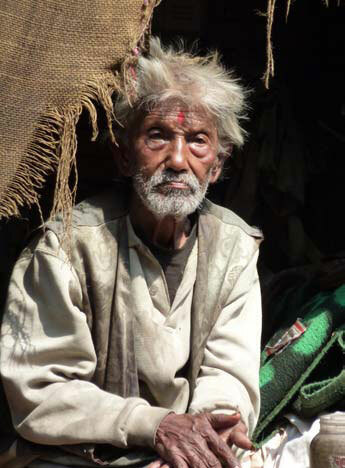 This feisty 70-plus guy had carried 25 kg of luggage up the same trail as us. Luckily, he got the last seat on the bus to Jomsom. He was a happy man. Today was a much easier day and extremely beautiful. After waking early to see the sunrise on the surrounding peaks, breakfast was a leisurely aff air. Nola had a nasty headache which, luckily, responded well to her regular migraine medication. She soon decided to try to walk, instead of the jeep we were considering, and found herself improving all morning. The walking was fairly flat and easy, the weather as clear as a bell. Morning tea at Kokethanti and then a long sunny walk across the bed of the Kali Gandaki once the boys had organised some stepping stones to get us across the first branch of the river. All the other seasonal bridges were intact. It was a stunning day. The variety of rocks in this river bed is amazing and everyone was scanning for fossils with occasional glimpses up to the fabulous hanging glacier on Dhaulagiri. The mountains were still very clear as we strolled through the old village after lunch and headed out onto the road. This much-maligned road is a God-send for the locals and I think we were passed by one jeep and two motorbikes all afternoon. The Tukuche Guesthouse, with its cosy little rooftop rooms, had lashings of solar hot water. Hair wash was good, and a few clean undies flapping on the line this afternoon. There was plenty of time for a stroll around the old village. I’ve just been told that the hot-table is fired up so I’m off ! Up early to see the sun lighting up the peaks on another very clear day – although the wind was blowing from the North which was a bit disappointing. We rugged up to walk into the wind but were soon over the big metal bridge and into the juniper forest where it was much calmer. After a cuppa at the Tibetan Refugee Camp at Chairo I noticed that Cheryl and Sue were getting quite blasé about the bridges now. Certainly, this last one was rather old and slightly wobbly. We were down to t-shirts in Marpha. This village is so snugged into the hill that its whitewashed alleyways are sun-traps. This was the season for cleaning out the house before one of the festivals (ask Mangal) and also for whitewashing the facade of your house. We saw several women looking like alien beings from Star Wars, completely spattered from head to toe in whitewash. 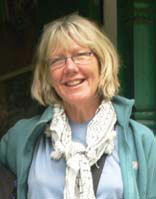 Sue and Steve were a lovely surprise at lunchtime with their Nepali friends Bishwa and Gouma. An hour after lunch we stopped at Mangal’s house for a cup of tea and a chat. I then took Mark and Nola (feeling much better now) to Upper Shyang. It’s a stiff climb but a short one and the village is completely unspoiled. We had a fun photo session with the locals. The Marco Polo at Jomsom was very welcoming. More hot showers (this has to be some kind of record), very hot-table, internet, TV – civilisation! It was a nice easy day today. Only 3–4 hours and totally flat – just a couple of surprise pinches just after the break at Eklai Bhatti. At the Asia Lodge in Kagbeni in time for lunch in the warm sunroom. And of course who should arrive half way through lunch but Steve and Sue with their friends. 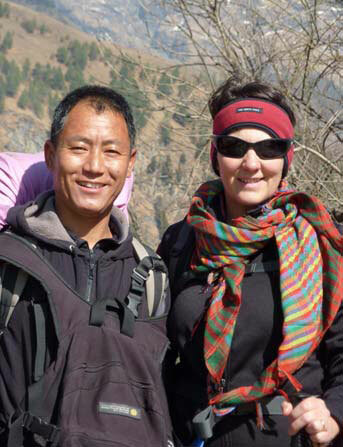 Their friend’s wife Gouma was making a religious pilgrimage to Muktinath. We had a great walk round this fascinating old village, visiting the 500-year-old gomba. We got some pictures from the rooft op there. Dinner of lasagna made with fresh tomatoes and dried wild mushrooms was one of the best. The boys played and sang and danced after dinner and we soon joined in. 10pm is a late night on trek. Thanks boys! Special mention goes to Lahar for his dancing and also the new boy Sunder who is gradually coming out of his shell. This was a truly adventurous day. While four customers took the wild jeep ride up a very snowy, icy, scary road, the rest of us along with Sue, Steve and Bishwa opted to ride horses up to Muktinath. They were definitely not as well-behaved as our usual mounts. Serge’s horse dragged him along the ground for a while when he dismounted at the rest stop. It then reared up horribly when the jeeps tried to pass us on a very dodgy stretch of road. It snowed lightly near the tea stop – very pretty. 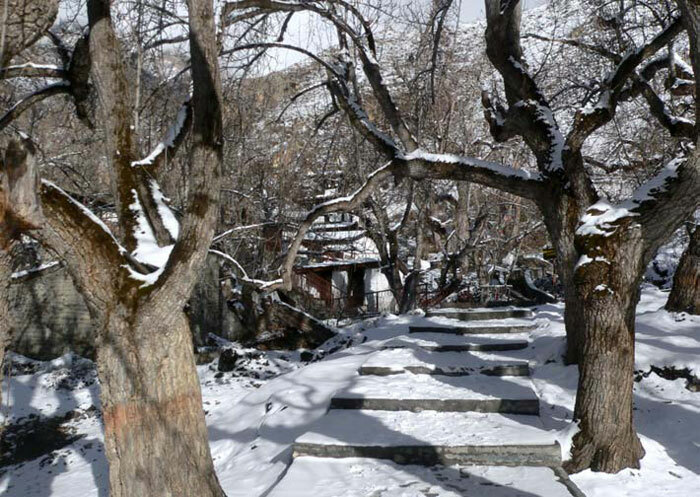 However it started snowing REALLY HEAVILY half an hour before Muktinath. The snow was very dry and we all had good jackets so I think some of us rather enjoyed it. It was certainly diff erent! With the hot table fired up at the Mona Lisa Lodge we settled in for the afternoon. However by 4 pm the weather cleared revealing a winter wonderland outside. Mark and Mangal made a quiet trip up to the temple, followed shortly thereafter by myself and Dorje. Too beautiful to stay inside. In the little gomba with the ‘flame and water in the rock’ the anis (nuns) were chanting something lovely so we all sat and listened for a while. Very touching. Most of us felt pretty crap after dinner with varying degrees of altitude-induced discomfort. We all turned in very early indeed. First Flight on Nepal Airlines (no long ‘Royal’ since the revolution) – no worries. Well, almost. The flight was sensational. We seemed to clear the first ridge after Jomsom by about 20 feet, I really thought we were going to touch down. The sky was a little hazy but it was a smooth ride. We took a most unusual approach to Pokhara which saw us winging past the Peace Stupa (I swear it was level with the plane) and then dive-bombing the airstrip in just 20 minutes from take off to landing. We stayed at the Snowland for a change. Very nice rooms but the service was pretty impersonal. Took our breakfast in the garden overlooking the lake at the Boomerang. Must do that more oft en. Nice lazy day mooching about Pokhara and a visit to Lahar’s home. Good pizza for dinner and a quick look in at Club Amsterdam to finish off the night. 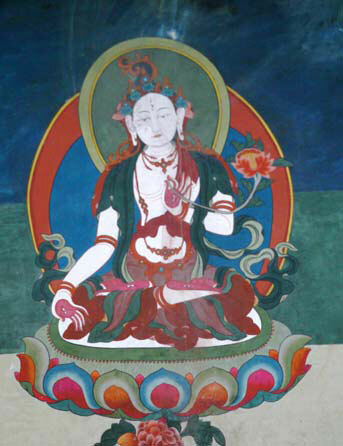 Mark and Nola bought an exquisite Th angka painting. With an 8am bus to catch we took coffee and a Danish by the bus depot. We had a great run on Greenline, no delays at all really, though it was the usual hair-raising ride. The Norbu Linka seemed very comfy after trekking and the huge variety of food on off er at the Weizen was much appreciated. With comfortable accommodation and TV in the room we opted for an early night after our long day on the road. Free day. Lots of souvenir shopping in the morning. 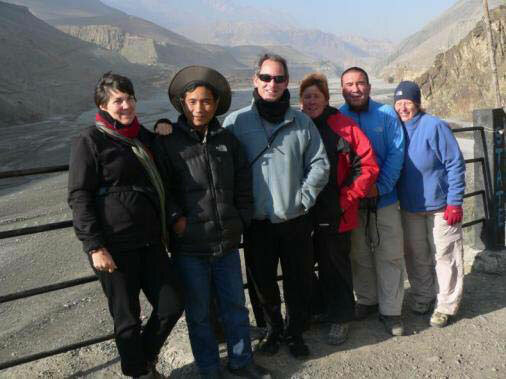 Doug, Sue, Serge and Cheryl were taken to Pashupatinath by Dorje – they found it extremely interesting. I took Mark and Nola up to Swayambhu and to visit Mangal at home. Dinner at the Roadhouse – pizza, espresso, lemon tart – lovely! Mama mia! Dissa trekking issa so hard! After breakfast in-house we drove out to Bhaktapur. It was Holi, a Hindu festival celebrating the triumph of good over evil. The celebrations mostly revolve around throwing water-bombs and coloured powder (mostly red) over each other. It’s a bit messy but can be fun. The local youngsters (lads mostly) get a bit hysterical and I read the next day that 3 people had died. By 3pm the worst was over so we took a short walk into the countryside. 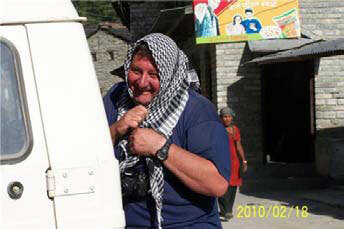 Our planned trip up to Changu Narayan was a ‘no go’ as there was no transport available on the day of Holi. Evening time in Bhaktapur is magical. Soft er light and with most of the tourists gone the town almost returns to normal. The street hustlers and touts are replaced by women selling vegetables. We ate our dinner on the outdoor terrace with the huge pagodas looming in the dusk. A boozy bunch of Poms were thoughtlessly noisy well after lights out but hey, nothing to do but sleep on the plane next day. An early stroll about for some and then onto the minibus for the airport. A bit too warm, a bit too smoggy – happy to be getting out of polluted Kathmandu perhaps. I know this trip was a lot harder than some of you bargained for and not all of it was perfect. However, I am sure you will never forget it! You did yourselves proud. You would have loved the huge thunderstorm tonight with an inch of hailstones in the street. Kathmandu got a good drenching clean up – just what it needed. Next day broke fine and clear – ready for the next trek. Goodbye my friends – I am off to do it all again! Acknowledgements: Frank Jones, Desktop Dynamics, Geelong (editing & layout); Mark & Nola Kontjonis (some of the photos).